Globally, the average land and ocean surface temperature for March through May 2017 was the second highest since global temperature records began in 1880, coming in at 1.66°F (0.92°C) above the 20th century average, second to 2016 by a mere 0.15°C (0.27°F). The most notable hot temperatures occurred over Asia, where temperature departures were 5.4°F (+3.0°C) or higher! The United States had its’ eighth (8th) warmest and eleventh (11th) wettest spring on record. The March through May average sea surface temperature was also the second warmest ever recorded. Spring marks the beginning of tornado season, and 2017 was no exception. More than a dozen tornadoes touched down across five different states on March 6th. Tornado outbreaks in early and late April across the central and southern U.S. resulted in at least 8 people losing their lives. And a record-breaking tornado touched down in Wisconsin on May 16th when an EF-3 tornado stayed on the ground for 83 miles – over 6 times the length of the island of Manhattan. 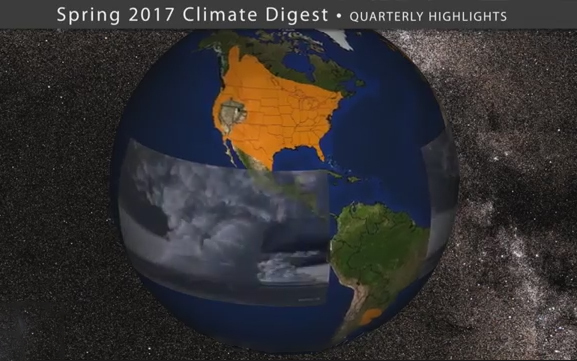 The quarterly climate digest, produced seasonally, consists of a short movie (2:54 minutes) made for SOS and an MP4 video accessible through YouTube.